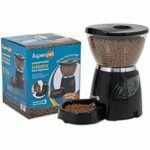 Automatic Cat Feeder Reviews - What's The Best Feeder For Your Cat? 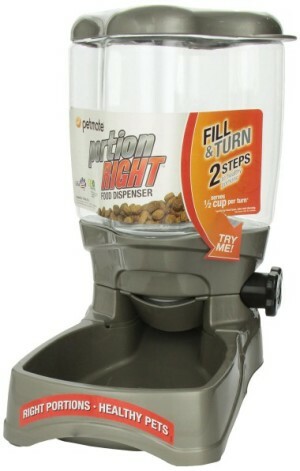 Cat food dispensers are a great solution to feed your cat when you are away from home but to buy one can be confusing. 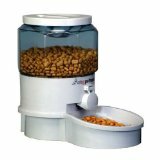 Don’t worry, here you will find a complete selection of the most popular cat food dispensers with pros and cons and very objective analysis of each one of them. Our ultimate goal is to help you decide the most suitable solution for you and your pet. √ Consider that in most cases people have to adjust the portions of meals through the trial-and-error method when buying an automatic feeder first time. √ Cats are very versatile animals and the reaction of your pet with any of these devices is unpredictable. √ Stars rating are overall based on our experience and also based in customer reviews for verified purchases. Ratings may be subject to change. √ Feeders that rate high but are not on top of the list are new in the market. We require at least 3 years of a feeder rating high to be on top of the list. 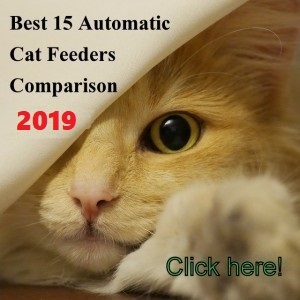 If you don’t want to go through the list to find the best feeder for your cat you may want to check a side by side comparison chart with the best 15 auto feeders. Petsafe Healthy Pet Simply Feed allows you to fully customize your pet feeding needs. With its special design, you can program a big breakfast and a small dinner, for example. 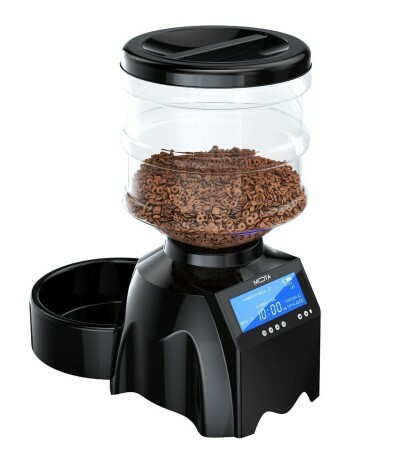 The minimum amount to be dispensed is from 1/8-cup and up to 4 cups at a time. Cats in a weight control program or with diabetes. 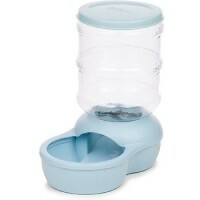 If your pet is allergic to plastic (you can adapt this feeder to use it with stainless steel bowl). NOTE: If you like the Super Feeder but you need more capacity, check here a full review of the CSF-3XL Super Feeder that comes with an extra 24-cup hopper. NOTE: Check here a full review of the Pet Feedster designed for dogs and small pets. Westlink 6L automatic pet feeder has the ability to dispense a wide variety of kibble, in shapes and sizes, without clogs or jamming, which gives peace of mind while you’re away. Its special mechanism allows little compartments to hold the food for the next dispensing, avoiding the dry food from getting stuck in the gear or chute. With Anmer A25 automatic feeder you can feed your cat up to 6 times per day, you can choose the portion for each meal, for example, big breakfast and small dinner. 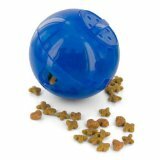 For cats that eat 1/2″ diameter size pellet food. 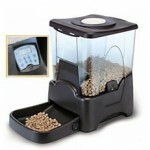 This feeder is accurate in dispensing food if using the appropriate pellet’s size. 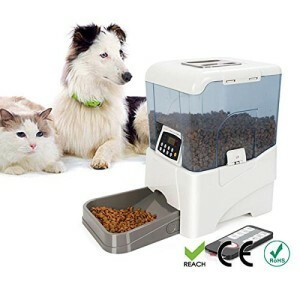 Wireless Whiskers automatic pet feeder gives you a real solution to your multi-pet feeding problems. This feeder works with a wireless tag that is attached to your cat’s collar and it activates the feeder to open when a daily portion is available in your pet’s diet. If you want to feed more than one cat, controlling the intake of each. If you want to stop your chubby cat from stealing the other cat’s food. If you have a dog and a cat and want to stop them from eating each other’s food. 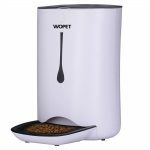 Wopet 7L automatic cat feeder allows you to feed your feline friend up to 4 times daily, within 24 hours. The feeding schedule is set for one day and this is repeated every day. You decide how much food you want to feed your cat in the morning, lunch and dinner. Also, you choose what time your furry friend will eat his meals. 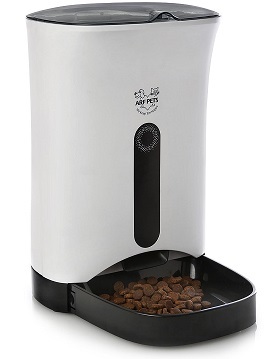 Qpets AF-200 is an automatic pet feeder with a capacity of 10 lbs dry food and with the ability to dispense up to 4 times a day, from ¼ cup up to 5 cups at a time. 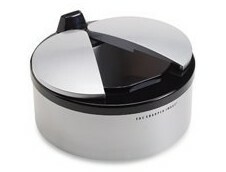 The bowl is removable and dishwasher safe, the hopper is transparent, allowing you to see the food level. Feed your cat several times a day (up to 8). Feed your pet different portions for each meal (for example, big breakfasts and small dinners). Customize a feeding schedule for your cat (e.g. feeder releasing food only on the weekends). Crown Majestic is a pet feeder that allows you to feed your cat and at the same time to supply a water station system, attached to the feeder. Smart cats obsessed with food. Cats on a diet if they eat 2 times a day, every 12 hours. If you don’t have a feeding schedule for your pet. If your cat is not overweight. 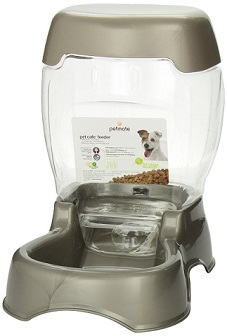 This food dispenser has a pet proof lock on the lid that protects the food from your cat, especially if your pet is always trying to get extra food. You can also record a customized personal message for your pet to call it when eating time comes. You use at least ½” diameter size pellet food. 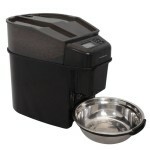 Arf Pets Automatic Pet Feeder dispenses up to 4 meals per day at the times you choose for your cat to eat. You can choose the size of the meals from 2 Tbsp up to 1 cup dry food at a time. 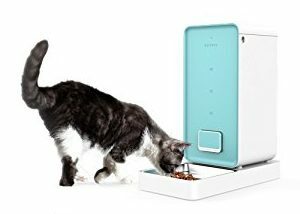 This cat food dispenser is programmable to dispense 1, 2 or 3 meals per day. You can customize the feeding schedule according to your needs, programming, for example, the time for your cat to get breakfast, lunch, and dinner. 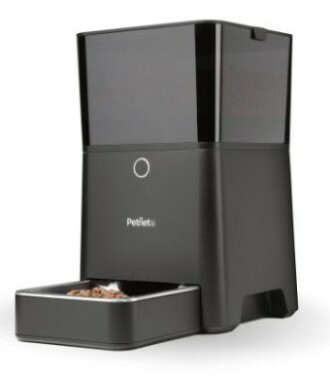 The Petmate Infinity dispenses from ¼ cup to 2 cups of dry food at a time. Are docile, not obsessed with food or determined to get extra food from the hopper. TopPets PF-21B comes with an infrared remote control that allows you to program the unit from a distance of 32-39 ft without barriers. You can also trigger manual feeds with the remote control as well. MOTA Perfect Dinner Pet Feeder with its new version, it has the ability to dispense up to 6 times a day, from 1/3 cup to 6 1/3 cup at a time, allowing you to adjust the portion size you want your pet to eat. The PetSafe Smart Feed allows busy cat owners to have full control over the automatic feeder. By using the App you can add meal times and customize the portions individually, according to your cat needs, all from your Smartphone, iPhone, iPad or Android. HoneyGuaridan is a smart Wi-Fi automatic feeder that allows you to control the feedings through your smartphone. HoneyGuaridan smart feeder can be programmed to feed your cat as many times as you need, customizing the hour and minute you desire. Also, each portion can be set according to your pet’s eating requirement. For example, you can feed your cat a big breakfast and a small dinner. Pet Station connects to the wireless network and allows you to watch your pet when eating through a built-in camera that turns on with Skype video calls. The high-quality camera image has image capture function too so you can take pictures of your cat. 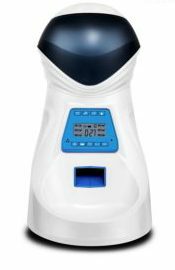 This unit has the ability to host Skype software and it features outcoming and incoming video calls to your smartphone. This means you can make video calls from your smartphone to your pet (feeder) and your pet can make video calls to your smartphone as well (by setting the unit to do so, see more details in review). 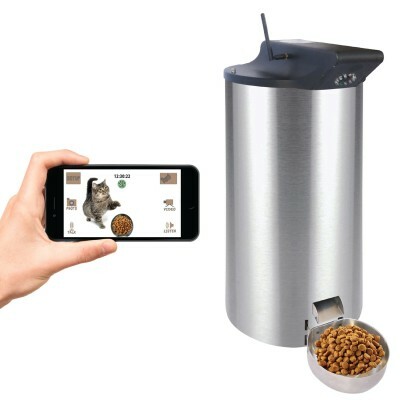 PetPal Wifi automatic pet feeder gives you the option to connect the feeder to a Wifi network and feed your cat remotely using your Smartphone or Tablet. You feed your cat big kibble and feed your pet once or twice a day. Petkit Smart feeder allows you to feed your cat up to 4 times per day, with a minimum portion of 20g and a maximum of 400g, so you can feed a single cat or multiple cats. With the Petkit App you can program and control the feeder from anywhere through your smartphone. It works with iOS and OS operating systems. 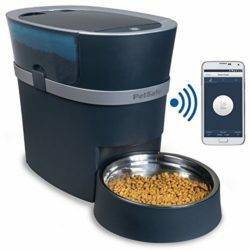 Petnet SmartFeeder is a smart automatic pet feeder that allows you to program and control your cat’s feeding activity through your iOS device, SmartPhone or iPad. You can program a fully customized feeding schedule and size portions anytime, anywhere on your iOS device. Also, you can adjust the feeding speed, keeping your cat from eating too fast. People with unpredictable working hours that need to manage remotely their cat feeding activity. GemPet SmartFeeder is a Smart automatic feeder that you can program and control remotely through a free downloadable app on your SmartPhone. To feed one cat that is not too aggressive when it comes to getting food. 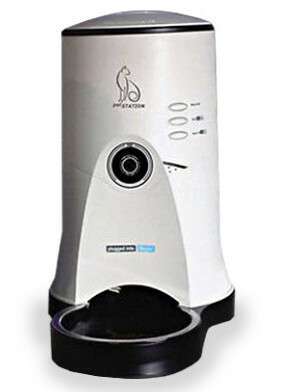 Hoison automatic pet feeder allows you to feed, see and talk to your cat anytime from anywhere on your Smartphone. 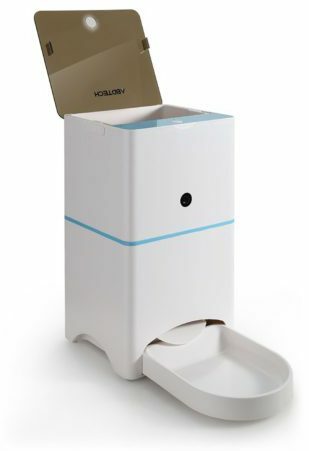 The unit helps you to manage your cat’s feeding activity and interact with your pet while you are at work, traveling or simply when going out to dinner. The Abdtech SmartFeeder is an automatic feeder that you can program and control with your iPhone or Android Smartphone or Tablet using the ABDTECH’s free App that you download from Google Play. 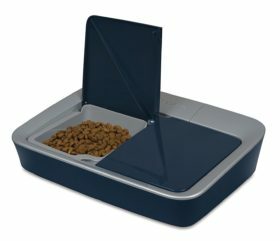 This unit allows you to feed your cat as many times as you want and with individually sized meals, according to your cat’s needs. The minimum amount of food to be served at a time is 10g (a little less than 1/8 cup) and the maximum is 100g (a little over a ¾ cup). 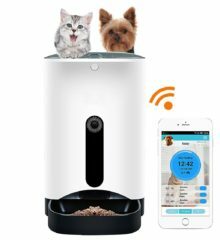 With Knox Smart Wi-Fi automatic pet feeder you can feed your cat according to a feeding schedule and also interact with your pet on a 2-way video/audio so your cat won’t feel alone. This means you can see your cat and your cat can see you. A large LCD screen displays videos for your cat to see you either in real time or displaying previously recorded 10-sec videos where you can talk to your cat and give him love. 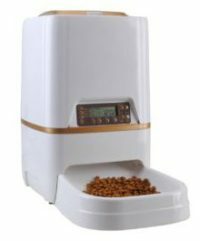 The HoneyGuaridan A36 is an automatic feeder that allows you to feed your cat up to 6 times per day, at anytime you choose. The meal sizes can be set individually, for example large breakfast and smaller dinners. PetWatch Automatic pet feeder allows you to setup up to 5 meals a day for your cat, each meal can be customized in size and time, according to your cat’s needs. The feeding schedule can be programmed to the minute, giving you the flexibility to adjust the meals according to the ideal time for your cat to eat. (UPDATE: This feeder is not available in the market anymore). Feed and Go is a unique Wi-Fi automatic cat feeder that can be set up and controlled using any internet interface, you can even program the unit on your laptop. The unit features a built-in webcam and microphone that allows you to watch your pet while he or she is eating and record a 6-sec personal message calling your pet to eat. Slowing down your cat’s eating by splitting each meal into smaller parts with minutes in between. People without regular working hours. SureFeed Microchip is a microchip selective feeder that allows cats to eat by recognizing their microchip implant’s ID or the ID in the collar tag. Sensors located on the hoop recognize the ID code and opens a lid for the authorized cat to eat. The SureFeed Sealed Pet Bowl keeps your cat’s food fresh and protects it from insects. 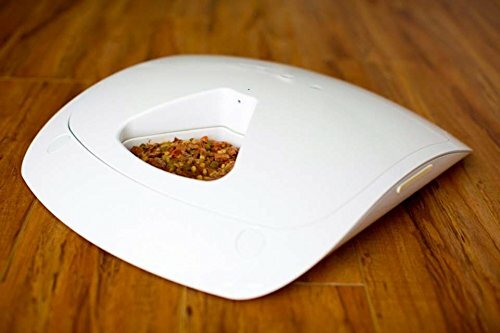 The bowl features infrared sensors that detect your pet’s movements and opens a lid, uncovering the food for your cat to eat. The sensor is not selective, this means any pet nearby the feeder will be able to activate the sensor and eat from the bowl. This automatic feeder serves up to 5 meals by day. The first tray has a cover to protect the food and it is served at present time. To use it during the day if your cat eats 3 or more times a day. To use it for multiple days with 1 or 2 meals by day. With Wopet 1-meal you can feed your cat fresh wet food because it comes with an ice pack and also it’s suitable to dispense dry food. Wopet allows you to create a 2 or 3 meal automatic feeder because it can be attached to extra units with special clips. For example, if you want to feed your cat dry and wet food simply purchase 2 units and attach them using the provided clips. Petwant 5-Meal is an automatic feeder with the ability to dispense up to 5 meals per day, 4 of them fully programmable. The Petwant timer allows you to program anytime and minute for your cat to eat, adapting the meal dispensing to your pet’s needs. Feeding two cats with two meals by day if they can eat together from the same tray. Petsafe 2-meal allows you to feed your pet two meals within 24 hours or one meal every 24 hours or whenever time you want to program the unit up to 48 hours length in advance. The minimum interval between each meal is 2 hours. Each tray has 1.5 cups capacity to hold dry food. 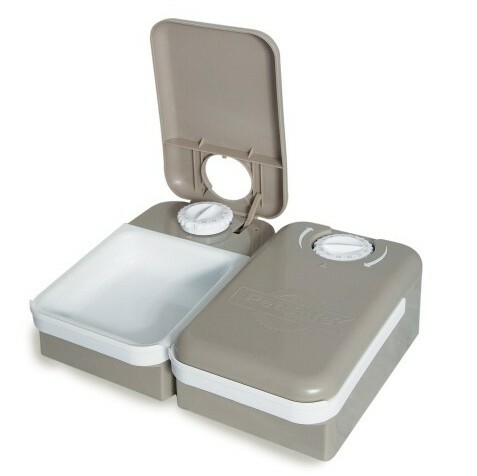 The Petsafe 2-meal is designed to feed dry food but some customers have managed to use it with wet food, freezing the food before placing it on the trays. PetSafe Digital 2-Meal Feeder allows you to feed your cat dry or wet food with the peace of mind your pet won’t get access to the next meal. 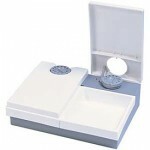 The design is secure and features two lids that are not possible to open without pressing a button. If you have a cat that has managed to open all the previous feeders this is a suitable unit for you. 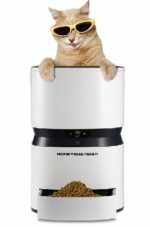 Cat Mate C500 is an automatic feeder that dispenses dry or wet food and it serves up to 5 meals, one at the present time while 4 can be scheduled. The automatic dish feeder serves up to 5 meals with a rotating lid system and 5 slots where you can put moist or dry food. The first meal is served at present time and it is covered by a lid. 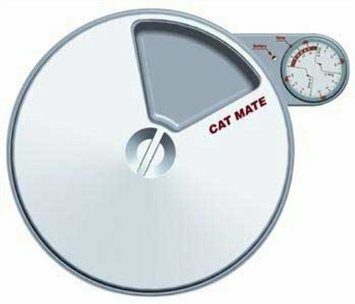 The Cat Mate C50 works with analog timer and you can setup feeding times with a minimum of 4 hours between each meal, with 90-hours total range mealtime program. The unit works with 1 AA battery (not included) FULL REVIEW. This dish food dispenser has a microphone, speaker and low battery indicator that allows you to make sure your feeder will work. It has programmable feeding sequences up to 6 meals by day. Docile cats that won’t try to break into the unit. Pets with specific regular meals on a diet. As a complement to other automatic feeding systems. If you are willing to set the feeder with a minimum of 6 hours in advance of feeding time (it doesn’t have a clock, it works with intervals). If you don’t want to use it for long periods away from home. 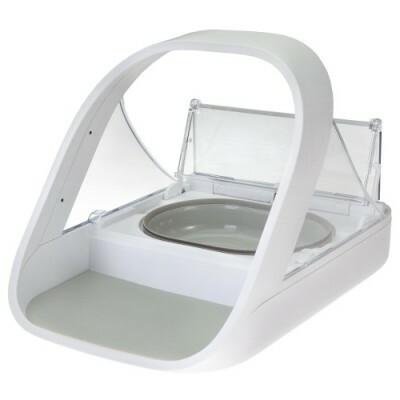 Wonder Bowl automatic feeder works with infrared technology that allows the unit to open the lid only to the pet that is wearing the unique tag on its collar. 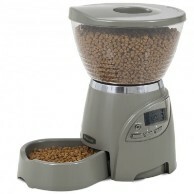 This automatic feeder is suitable for multi-pet households and to feed cats on a prescription diet. The unit includes a unique tag for the pet you want to feed. 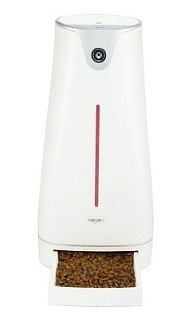 WOpet is a timed automatic pet feeder that allows you to feed your cat up to 2 meals in 48 hours. The unit uses a counter clock timer that works with an hour increment. Each compartment has its own timer so they can be set to open at different scheduled times. Sharper Image is an automatic dish feeder that keeps your pet’s food fresh and clean because its lids are closed all the time and they only open when a sensor detects your pet motion. When your pet gets close to the feeder, in front of it, the sensor detects the movement and it opens the feeder’s lids, exposing the food for your pet to eat. For people that don’t want to measure portions and pouring food into a bowl anymore. To control the food intake of overweight cats. To feed your cat the right portions. Bergan Pet Feeder Travel has a special design to feed your pet when you are traveling. With this unique system, you can feed your cat and continue your travel, that easy. Petmate Le Bistro gravity feeder provides your pet a permanent source of food without the need of refilling the bowl every day. The unit features a good capacity with 18 lbs dry food that makes this feeder suitable for multi-cat households. Additionally, the Petmate gravity feeder has recessed handle areas that allow you to lift and carry the feeder easily. If you don’t have your cat on a diet. If your cat is well disciplined with food. If you want to feed several cats. Feeding and supplying water to two cats. To be used indoors, not exposing the feeder and waterer to external elements. For cats that don’t have a feeding schedule to follow. Petmate Café feeder works by gravity so the food stays available all day for your cat to eat. 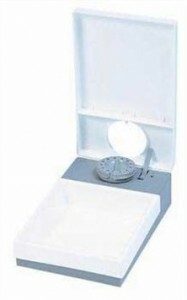 The feeder has a clear transparent food hopper that makes it easy to see the food level at a glance. If you are willing to check on the feeder and shake it to keep the gravity working. This website was created to help you on the adventure of feeding automatically your loved pet. We hope our content is useful for you and if so, we are very happy to have accomplished our goal! Comments or suggestions are very welcome! Very informative article, might just have to invest in one of those gadgets for our two. They seem permanently hungry at the moment. The Le Bistro it seems has been “enhanced” since the last review on here. There is a flap which will prevent a cat from reaching up the chute to the food. Also the top and hopper seem to be much more securely fastened to the base than previous models. As for portion control yes it does over feed with small pellets but only by about 2 tablespoons. For the price difference I think I can live with that and just feed my cat fewer times a day. Thank you very much for your contribution Pilotman. The nozzle problem was very usual in lots of customers and it is good to know they have fixed that problem. My ultimate goal is to help people not waste money in something it won`t work for them. About portion problems, if your cat is not overweight or diabetic, it makes totally sense what you say, especially if your cat is active and can eat little extra food from the feeder. I will begin to investigate Le Bistro again to make a new review. Thanks again for your input! I need to feed one cat often and not let the others access his food. Since I’m away at work all day, I was wondering if there was a feeder that would open only when that cat went to it, via a signal from a collar, for example, and would close after he leaves. They have this kind of thing for cows in barns where they can move around. Have you ever seen a feeder like this for cats? So far is the best solution for this problem. I hope my answer helps you. Good luck! 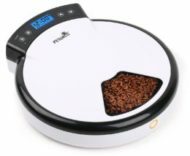 Update: an excellent automatic pet feeder that resolve this problem is the “Wireless whiskers” that works with ID in the cats collar and opens only after recognizing one particular cat from the other. You can find the link here of this great feeder. 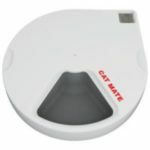 Your reviews of the Cat Mate products are very helpful, but before I try the Cat Mate auto feeder, do you have any recommendations for an even better product for wet food? My two cats are strictly wet food eaters, and I have no idea if my they would be aggressive about raiding and disabling the feeder; I think they are more likely to be frightened by whatever noise it makes. In any case, I’d plan on buying two so they wouldn’t compete for the food once the tray opens. 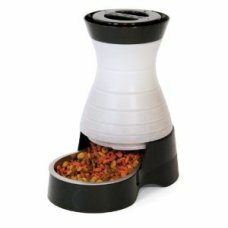 Are there any higher rated feeders that also have some system for keeping wet food fresh? Hello Joe, thanks for your question. Before an answer, how many times do you feed your cats by day? and the other question is: what is the length of period do you want to feed your cats? (example, 2 times a day within 10 hours or 3 times a day within 24 hours, etc.) Thanks! Another option is the Super Feeder which has digital timer which allows you to program a minimum setting of 1 second (length of time the feeder releasing food) which is a fraction of a cup. Hope I could help you and good luck! 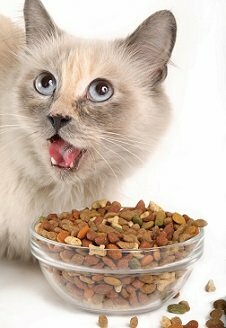 If a cat has diabetes he or she shouldn’t be eating dried food! Dried food has far too much grain: this is what probably caused the diabetes in the first place. Thank you for your comment John. If you notice all the automatic feeders I recommend for cats with diabetes are the one for feeding moist food and not for dry food. Anyway, to figure out what is the best type of food (if dry or moist food) is completely decision of the cat owner based in their searching about this topic. But if they decide to feed dry food their diabetic cats whether because availability of dry cat food for diabetic cats or any other reason, they will find useful information in my website. Thank you again for your input, I am sure cat owners will appreciate it. 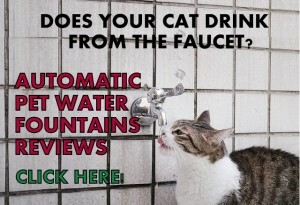 Just came across your site when looking to find a dispenser our Burmese cats can’t break into while we aren’t there. 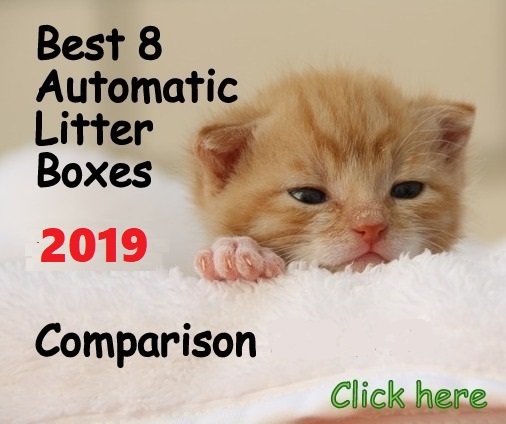 One is what you would call a locksmith cat – not only does he knock out the flap on the 6-MEAL LCD AUTOMATIC CAT FEEDER ★★★ but he can somehow remove the whole cover and access the food below. He is also a guts who will push our other cat out of the way to eat his food too. What would you recommend for two cats, where one is very sneaky, determined and obsessed with food? Hello Lara, thank you for your question. 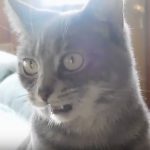 It is hard to feed two cats at once when one of them is obsessed with food because usually the one that is food driven eats the other cat’s food before the docile one finish its meal. My suggestion is to use an automatic pet feeder especially designed to resolve this problem. It is the “Wireless Whiskers” automatic feeder which works with wireless ID in the cat collar and allows you to feed your 2 pets individually without problems because it opens only when it recognizes each pet. You can find in this link this great feeder. You need to review Petfeedster! I bought a Petfeedster in April 2011 and have used it everyday since. It can be used for cats or dogs; we have a cat. It is an ingenious, well-designed device that is versatile, efficient, and effective. It has been well worth every penny of the $199 I paid two years ago. It now sells directly from the manufacturer at $249. The flex feeder assembly has worn out after two years; I ordered it online for only $25 plus S&H. We can sleep in or stay out late without worrying about Tiger going hungry. We can go out of town for a few days and have a neighborhood petsitter come change the catbox and play with Tiger at his/her convenience without worrying about Tiger getting fed twice a day at inconvenient times. It has a battery-powered back up system to prevent loss of function in a power outage. It can be set up to feed as many as 5 times per day using dry food from ⅛” to ¾” size pieces. I will. Thank you very much for your input. Our readers will really appreciate this new review! We noticed that Wireless Whiskers had disappeared from the 2013 Reviews. We had some technical issues with this listing disappearing on Amazon, and maybe you thought it was no longer available. This problem has been resolved and I hope we can be added back to the 2013 review, as you did an excellent job describing our product for your subscribers. Thank you. Thanks for your contact Steve. Exactly, I thought the product was not available anymore. I will put the review back. Thank you for noticing that your product was not here. AS owners we have no way of knowing every product out there and noticing that one is missing that is a good choice for us to use. I like that the company is watching what is being said about the product and if anything is being said. The product is on the list if you look carefully. What do you recommend as a wet food feeder for my cat? I want to feed him wet food twice through the day when I’m gone about four hours apart. I want to make sure that it has some type of a cooling feature on it. Is the cat mate c20 The only one you know of that offers the ice pack feature? Have you heard anything from other people about how effective this is like keeping the food fresh? Hello Angela, thanks for your question. If you want to feed your cat twice a day moist food with 4 hours apart the C20 is a good solution because each lid has its own timer and you can set up the times at anytime you want. Plus, the ice packs lose the coolness from 6 to 10 hours, depending on the climate you live. A good tip to keep the moist food even fresher is to place it frozen on the trays plus the ice packs underneath the feeder. The other alternative is the C50 that has 5-meal-capacity, one of them to be eaten at present time but is not practical since the ice packs lose the coolness in about the same time between 6-10 hours so it would not be worth to fill the 5 trays with moist food. This solution is more practical for people that feed the pet more than 2 times a day wet food. Note that cats can smell the food from these feeders, especially wet food so you have to make sure your cat is not so obsessed with food, it is a “good boy or girl”. Cats are very unpredictable when it comes to feed them automatically. Hi, I’m wondering if the C50 will work with wet food only for two days in a row if it is frozen first? 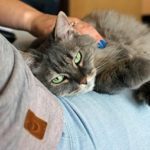 My cat needs to be fed wet food only twice a day, but it would be easier if my pet sitter only had to come every other day. Just wondering if the food will still be okay on the second day if it starts out frozen. If not, do you have another recommendation for a wet-food only cat? Thanks. Hello MG, thanks for your question. How long the ice packs last and how long the frozen food lasts will depend of the weather where you live and the room temperature. If we consider an average temperature room (approx. 70°F) and if you use canned wet food and you freeze it before and place it on the trays without spreading it, the 3rd meal might still be OK for your pet consumption. However, I am not sure about the 4th one. Consider that the ice packs melt within 4 to 10 hours depending on the weather, still keeping the coolness though. If you don’t want to waste the money buying something it might not work, maybe it is a good idea to do a test first. If you have ice packs on your freezer use them underneath any plastic container with a lid. Place the wet food there and cover it with the lid and wait 48 hours and then check the condition of the food. That way you will make sure the device will work fine, according to what you want. I hope I could help you and good luck! There seems to be a large price difference between these products. The CSF Super Feeder seems like the best bet in terms of reliability. Yet, at less than 1/2 the price is the PetMate LeBistro design any better these days? Edit – Sorry, I did some further reading on Petsmart. Recent reviews seem to continue to blast the LeBistro feeder for the poor trap door design and improper portion release. Hello Marc, thanks for your question. Yes, the CSF-3 Super Feeder is one of the most reliable feeders. And the Petmate Le Bistro has some issues like the one you just described. I would recommend that device only if you want to feed several cats where the daily dispensing amount is not a big issue and where none of the cats are obsessed with food. Hi. Thank you for your reviews and information. It is very interesting. I have a single indoor cat that is fed dry food during the day (left out for her to eat when ever she wants) and a wet meal once a night, around 8pm. Hello Fernando, thanks for your question. If you are in the tropic climate I am afraid that there is not any device that can keep wet food fresh for 7 days. Any ice pack melts and loses the coolness within 6-10 hours depending on the climate. 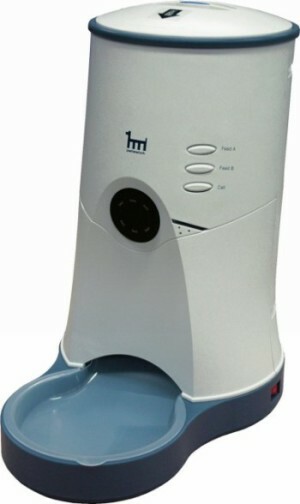 For wet food I would recommend you the Cat Mate C20 but this device would feed your cat 2 and maybe 3 of the 7 days. And you have to use it with the follow instructions: Putting frozen canned wet food without spreading it on the tray and with the ice packs of the Cat Mate C20. And this would work as I said, only for 2 or 3 days at the most. 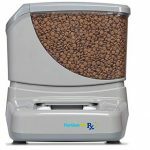 Regard dry food I can suggest you the Super Feeder which can be programmed to dispense food according to the schedule you need for your cat and it is a very reliable feeder. The Super Feeder can be programmed up to 7 days as well. So my suggestion is to feed your cat dry and wet food the first 2 days and then only dry food. Or only dry food the whole time. It is also important that you ask somebody to check on your cat after a couple of days because 7 days alone it is too long for leaving a cat alone at home. I hope I could help you and good luck Fernando. I am the owner of one very hungry cat who likes to make her point of ‘I want food’ very early in the morning (and pretty much all throughout the day). She is on a (more or less permanent) diet of three feeding times a day. I am pretty sure she would violently attack any feeder, so I just want to know which ones are really really sturdy and which ones I am able to get because I live in the Netherlands and not many are available. I am considering to buy a Cat Mate product (either the C50 or the C3000) because that is almost the only available brand here in the Netherlands. Is this a good idea? Should I try to import another one for guaranteed success? Hello Eva, thanks for your question. I think the Cat Mate C3000 will work OK for you if you manage to keep your cat away from the lid and the nozzle like this smart solutions from current customers. 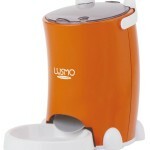 Smart cats can move the lid off and also get extra food from the nozzle with this feeder. And if you use small size pellet (1/4″ diameter size) make sure to setup the feeder in smaller amounts than you really need because the accuracy is not 100% with small pellets. If you do all this you should be fine with this feeder. A second suggestion is somehow to get the Super Feeder which is more reliable, accurate and it works better with small round pellets. The advantage of this unit is that you can connect it to a home automation system for a better control of the unit being away from home and you can also mount this feeder into a wall to keep your cat from reaching the food. You can see examples of this on my Super Feeder Review. I hope I could help you, and good luck! Nice website! I am currently looking into automatic feed systems, and I think I prefer one that is accessible through an app. I was wondering what you think of the feed&go and the Petnet SmartFeeder. I have not made reviews of those automatic feeders yet but I will keep them in mind for a review to help our readers. Thanks for the collaboration. I am looking for a feeder for my two cats. I live in Canada and I was wondering you have any recommendations for Canadians buying. I don’t have an issue ordering from the USA but I don’t want to have to dish out extra money for duties and such at customs. 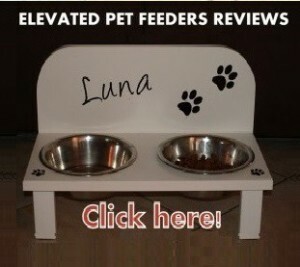 I have been considers the Pet Feedster and the Perfect Petfeeder. Hi Amanda, thanks for your question. There is a page on Amazon explaining the shipping cost buying items from Canada. Also, I have to mention that you made a good choice with the Petfeedster. There is a special new version for cats, you may want to check it out. What product would you recommend for a cat that is awakening it’s owner every morning at 6am crying to be fed? She is fed twice a day, in the morning and in the evening. Thanks for help. Hello James, if you want your cat to eat a healthy amount of food daily, let’s say 1/2 or 3/4 cup by day, you have to buy an automatic feeder with the ability to dispense this amount of food by day distributed in more than 2 meals by day. This way your cat will be able to eat more than 2 times a day, adding the 3rd meal at 6 am without exceeding the recommended intake for an adult cat. The other feature you need to look for is the ability to customize the meal-times you want to set for your cat. Automatic feeders that accomplish this are: Pet Feedster, Super Feeder, Ergo Pet Feeder. 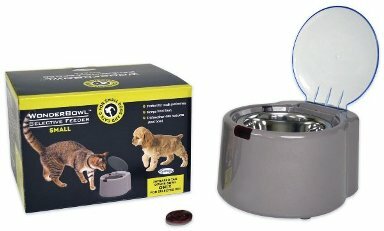 Another alternative is the dish shaped Petsafe 5 Meal. These automatic feeders are reliable and the best in the market. Good luck James! Hi – I wonder if you can help. I have two quite sick cats who are on a strict raw food diet (wet only). One is food focused and will push the other out of the way to eat her food also. I need to find a way to feed them when I am stuck late at work. I am based in London, UK. I looked at buying two of the wireless whiskers but that is dry food only and not available in the UK anyway. 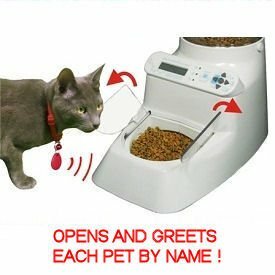 Hi Wendy, I don’t see in the UK automatic wet food feeders what work with tags but you can create a special feeding station with microchip flap for the cat that does not get to eat. You can see my post about it. This is a very good solution because it’ll completely stop the cat from stealing the other cat food. Good luck! LOVE your site. THANK you for doing this. Hi Sarah, with the requirements you ask so far there is one model, the Wonder Bowl, I have not made a review of this product yet but you can see details of this automatic feeder here. 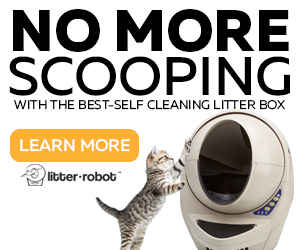 It has infrared technology to detect each cat and an insert stainless steel bowl. It has low battery indicator as well, but it does not have ice pack. Another choice is the Petsafe 5 Meal which does not have ice pack underneath but current customers have found good ideas how to use it to keep the wet food fresh and also ideas for cats with allergy to plastic. You can see more details of this in my review. I have a question about feeding my cat. With all the stir about wet and dry food, I recently started to give my cat both. She is 13 years old, 17 lbs. female. I have been feeding her a 1/4 cup of dry kibble in the a.m. and 1.5 oz. of canned food in the evening. I switched to diet kibble in the feeder (a.m.) but it hasn’t began to dispense as of yet. She has arthritis in her front legs I know from the weight. I don’t want to make her sick by not feeding her enough and also not make her sick by feeding her to little. Thank you so much for your help and LOVE your site!!! In 2 days she lost 3 ounces. Wow that kinda scares me. I know its a good diet but I think to much toooo fast! I added 1.5 oz wet food in the a.m. with the 1/4 kibble and 1.5 oz wet food in the evening. Hello Jamie, a rapid weight loss could be dangerous for a cat. A good rate for a cat to lose weight is about 1-2% of its body weight per week. When cats lose weight too fast is highly likely the weight will come back once the diet is over. Also, some cats could experience liver disease and even failure due to hepatic lipidosis. My suggestion is you to register your cat weight loss in a week and check if this fits in that rate. My best recommendation is taking your cat to the Vet and make a diet plan with him for your cat to lose weight safely. I am happy you like my site :-) thank you for your visit. Good luck! I figured up 1% and I am a bit confused. She weights 16.7 if I take that times 1% I get 0.167 is that ounces? That would equal 16 ounces? Which would equal a pound? Thanks so sorry to be a bug! Hi Jamie, you go 16.70-16.53 and the difference in pounds (0.17) go to a converter to ounces and you will get the 2.72 ounces. It is the way I did it since I am more used to kilos lol! Good luck! FYI – I currently have a Le Bistro which worked OK for a couple years (except that the portion control was not great), and now my cat is obsessively beating it to get extra food out. 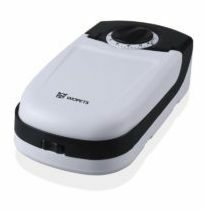 But I really like the battery option so I don’t have to worry about the power going out and disrupting the food supply. Hello Lesley, the only automatic feeder that is able to work with both AC adapter and batteries at the same time is the Pet Feedster. This automatic feeder will be available on the end of June I understand. The Super Feeder is an excellent automatic feeder too and if you experience constant power outages the Super Feeder is able to dispense normally as soon as the power is restored and that is why it is a good idea to program the Super Feeder with several small meals by day, up to 8. If the power outages you experience in your area last a long time (more than 10 hours) I suggest you to wait for the Pet Feedster. Thank you for your reply Lorena. I think we’ll wait for the Feedster just to be safe… but good to know about the Super Feeder. I was looking for a feeder for my son’s cat so I’ll get to see him more often. His cat always eats until the bowl is empty so they have to spread her feedings out during the day. I have sent them this link so they can choose for themselves. Thank you! One question I had though was about kibble shape. All my life the dry food we’ve fed was shaped like stars, fish, triangles, Xs and so on. Yet your reviews talk about a round size, 1/4 or 1/2 inch. What do you recommend for dry food of various shapes and sizes? Hello Gina, for stars, fish or triangles shaped food I recommend automatic feeders that don’t use screw systems to push the food out because they get stuck most of the times. 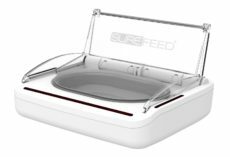 The Super Feeder has a different system so it does not get stuck and works with any size or shape of food. I recommend round 1/4″ diameter size food because the Super Feeder gets a better accuracy when dispensing with that size and shape. If using a different shape or size with the Super Feeder you simply have to program it through trial and error method till getting the exact amount needed. All sophisticated automatic feeders work like that because you don’ program them by cups or ounces, but by the time of the feeder releasing, for example, 1 minute of the feeder dispensing is equal to one cup of dry food. Hello Katie, I haven’t made a review of a product like that yet. I think all automatic cat feeders that cover completely the food have some automatic system to open. However, some time ago a follower of mine from England asked me about a feeder she knew it was sold in Italy and could not find the website. After a good researching I found the website and sent it to her. I think this feeder is distributed only in Europe so it’s sold in euros. The page it is in Italian but you can use a translator. In my opinion this is a good solution for what you need. Here’s the link. Maybe you can send them an email and ask. Good luck! Update: Hi again Katie! I came across to a new feeder with a system to open and close as the pet gets close to the unit. The brand is Sharper Image. I have not made a review yet, but you can take a look to this unit and see if you like it. You can see a customer’s video how it works here. I bought the CSF-3 Superfeeder–it works great! I plugged it in with my Lowe’s Iris WiFi kit and I can now feed my cats dry food from anywhere in the world via WiFi or smartphone app. This is by far the BEST option on the market for dry cat food period. I have been trying to find a suitable feeder for canned cat food. Though I have not bought it yet, I did find a thermoelectrically cooled one from Germany called “Catsomat”. Perhaps you can review it someday. Thanks for your informative site. I am happy you have had a great experience with the Super Feeder, Dean. About Catsomat I checked it and it seems like a great device though, very expensive ($520). I will do a review of this device soon. I am trying to find an automatic feeder for wet cat food that my 12 lb cat can’t outsmart. Needs to handle at least 4 meals so that it only has to be filled daily. What is the best one you can recommend? Hello Forest, wet cat food feeders generally are subject to be outsmarted by cats because they contain food with fresh and strong meat odor that is irresistible to cats. To me, a good option is the Petsafe 5-meal electronic pet feeder (though it does not have ice pack) because it has a digital timer which gives more accurate feeding times, it is sturdier than other wet food feeders and trays have a good capacity. The “Con” of this feeder is that it does not have ice pack underneath the trays but what customers have done is to freeze wet cat food cans and place them in the trays only spreading the first meal and this way they take longer to thaw and they last fresh longer as well, for about 10 hours. If your cat is too smart and tries to get food from the first covered tray, you can place the food in the second tray but this way your cat will have only 3 meals daily. Good luck! Thanks. I’ve ordered one for a try. Your idea about freezing the food is especially good. Will let you (and others) know how this works out. Cool! don’t forget to let me know. Good luck! my cat easily worked out how to put his paw under the lid of the c20 catmate feeder and pop the lid so i would not recommend that model! Im in market for the sturdiest one around now too!!! Hi Sale, the CatMate C20 is subject to be opened by smart cats that are very determined to get extra food. It works much better with docile cats. Thanks for sharing your experience. 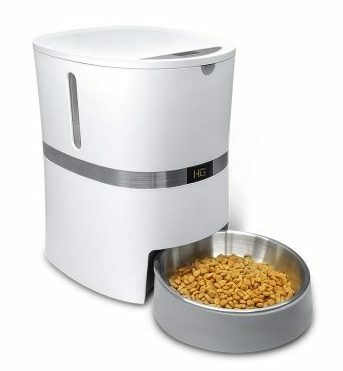 Hello MaryG, there are various good automatic cat feeders that allow you to program meal times at different intervals. 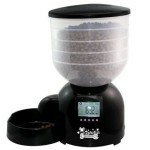 A very good automatic feeder is the Super Feeder with digital timer, that allows you to program whenever you need to feed your cat 24/7 and one week in advance if you want. 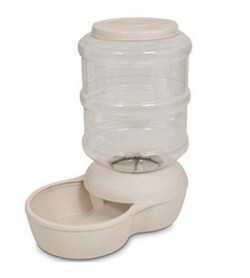 The feeder can be programmed to release minimum amounts of foods, as little as a tablespoon to cups of food at a time. 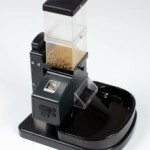 You can see a review the Super Feeder here. Hi Heidi, the Super Feeder is sturdy, well protected because it is all assembled by screws and it comes with an extra hopper as accessory. The hopper can be mounted high to protect the food from animals. You can check my review and take a look to pictures from customers who set the Super Feeder outdoors. Anyway, I am cat’s father, and he is 1 year old. He got a problem about his stomach, so I right down here for your help. He got really sensitive stomach. but he got almost diarrhea but one(royalcanin gastro). So, I ask you respectly..
Could you recommend some kinds of cat food? = He didn’t get diarrhea, but he got very very very soft feces. = He got good poo. Please advice me, and reccomend some kinds of cat food. Hello Kim, I understand your cat has gastrointestinal disease and that’s why it has all these problems with food. I would love to help you but I am not a Vet and I am afraid any food I could mention would be bad for your kitty. My suggestion is if maybe you can work out some special food for your cat with your Vet? it may be costly but I think it’s the only way your friend will be healthy since he has some abnormality in its digestive system. I am sorry I could not help you more! Hugs! Our cat had the same problem until we stated feeding him Blue Buffalo Basics limited ingredient food. It’s the only one we could find that we could use all the time, that he actually likes eating, and that didn’t give him diarrhea. But definitely check with your vet as well. Hi Stephen, the Super Feeder is a very reliable automatic feeder and it can be used with stainless steel bowl. You can see a video here. Good luck! When I adopted my cat they said she had an allergy to plastic and I had t use glass bowls. Hopefully you can sub a glass bowl in for the Plastic/stainless steel. She did eventually seem to adjust out of that. She is 11 now though, and maybe her’s was not an actual allergy. 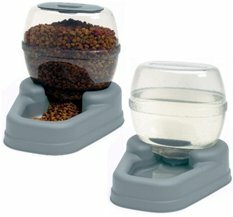 Both feeders the Super Feeder and the Cat Mate C3000 have removable bowls so you can place a glass bowl instead. I wonder if you can help me cut to the chase of choosing a feeder. I have a gluten allergy and a little extra money to buy these feeders at the moment. Affordable cat, dog, and fish food all have wheat gluten spelled out plainly (which gluten sufferers prefer the clarity), or wheat barley or rye in some form or trace. Getting gluten free pet food(not the same as grain free guys! trust me, tried that road and suffered for it) is not a current option for me at this time or in the near future. What feeder do you suggest for less than $100 (preferably a lot less). I feed at home with electric available or batteries obtainable. Hello Tonnie, I am sorry about your allergy, that must be hard. Regarding the automatic feeders I can give you ideas for your 2 cats. 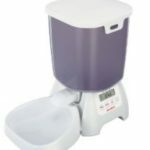 The Super Feeder 3XL Combo allows you to forget about filling the hopper often because it comes with a 1.5 Gallon extra hopper, making a total of 1.8 Gallon capacity of this feeder. This is a long time without the need of refilling the feeder, but I understand you have a budget so the other options are the Crown Majestic and the Cat Mate C3000. Some points to consider about the Crown Majestic is that you can feed your cats twice a day but with 12 hours apart between each meal and a total of 1/2 cup of food every day each cat, maybe a little more, depending on the kibble size. This feeder does not work with very small or flat kibble. The Crown Majestic has a 4.4 lbs capacity so it does not have very much capacity to make you fill the hopper only twice a month. The Cat Mate C3000 allows you to feed your cats up to 3 times a day from very little amount of kibble at a time (2 tbsp) up to cups a day. The capacity of this feeder is 6.5 lbs. Good luck Tonnie and take care! Lorena, really big thanks for your wonderful review site! 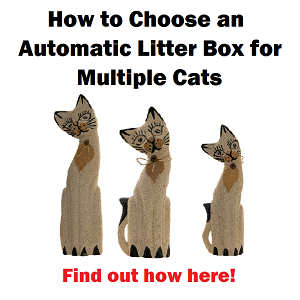 It helped me tremendously when I was struggling to find a suitable cat feeder. I had originally thought of one model, but based on your careful reviews, went to another model (Petsafe 5 Meal). It has proved to be a perfect match for me and my cat, I even purchased a second unit to the summer cottage. 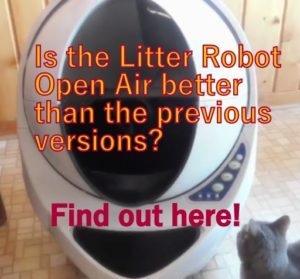 I am trying to decide to purchase either the Pet Feedster PF-10 Cat or the Pet Feedster Automatic Pet Feeder. I have decided on this brand, because we want the security of having a feeder that is electric with a battery back-up and because we want something reliable. My cat, Toby, was diagnosed with Inflammatory Bowel Disease and Pancreatitis and we have found out he has food allergies. Toby eats 5 times a day – 1/8 of a cup, at 3:00 A.M., 8:00 A.M., 12:00 P.M. 4:00 P.M. and 9:00 P.M., so we need a machine that is able to be programmed at these times and able to dispense an 1/8 of a cup. He eats Royal Canin Hypoallergenic Hydrolyzed Protein cat food. Can you please give me advice on which machine to purchase? Thank you for your help. Hello Beth, the Pet Feedster (For pets and adapted for cats, both) dispenses from a tablespoon to cups of dry food at a time. 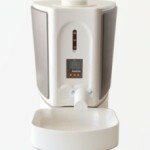 It can dispense up to 5 times a day and it works with batteries and plugged (simultaneously). With the digital timer, you can program the meal times according to your cat’s needs. Good luck! 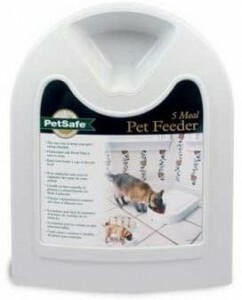 I am looking for a feeder with timer to suit my cat who eats too fast and regurgitates. Some of these look amazing, but can you tell me if they are available in Australia ? Hello Anna! the Petsafe Healthy Pet Simply Feed has a special feature that is called “Slow Feed Mode” which prevents cats from inhaling the food. You can set the meal to be dispensed in 15 minutes range, which allows the food coming out slowly from the feeder. Unfortunately, I don’t know if they ship to Australia, I am sorry I could not help you with that. Thank you for the reviews and for answering questions! I purchased 2 of the PetSafe 5 Meal Feeders 6 months ago for my two cats (who eat at the same time, but sharing bowls doesn’t work so well so I bought them each one feeder). It has been working out great. Except that I recently I realized one cat may be developing chin acne. I checked out the Sur La Table website and couldn’t find any stainless steel bowls that would fit into the feeder…and I’ve looked at many different stores and couldn’t find anything that would fit the right shape. Do you have any other ideas of where I could find another material of bowl to work with this feeder? Or ideas of other options? Thank you! Hi Shaunga, this is the link. If you are going to buy the prep bowl online buy only one to make sure it fits perfectly, it should though since the shape has not changed. Good luck! I feed my cat Royal Canin Urinary SO dry food. 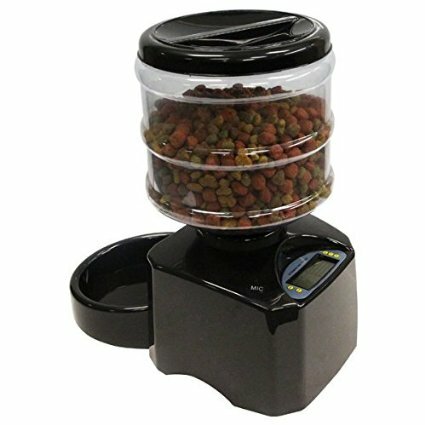 Is there another automatic timed feeder you would recommend that isn’t going to be 210$ like the Pet Feedster? I haven’t found anything to be honest and I’m really interested in getting something a little bit cheaper that won’t jam. I suggest you the Feed and Go, you can feed wet and dry food. You can program, control and feed your cat in real time through internet and see your cat eating through a built-in webcam. You can check a review of this unit here. Hello there! I am due to go on holiday for a week and need to purchase a reliable feeder (or 3!) for my three cats. They are used to being fed morning (biscuits) and evening (wet food) and so I want something reliable for the morning rota that can be programmed for the time I am away, then a friend will do the evening duties. I am so scared they won’t get fed and I am a little baffled by the options out there! Can you help / recommend please? I’m based in the UK. Thank you. Hello Amanda I recommend you the PetFeedster if you need a very reliable feeder. Good luck! We are stumped. We have 2 16 yr old cats both with healthy weights. They are both microchipped and wear collars. They are indoor cats. They both have thrived on unlimited supplies of dry food with wet food served once a week. Nori has advancing kidney disease. She is now on Rx wet food and very limited Rx dry whereas Sake can continue on her regular diet. How do you recommend we feed them given that Nori will remain attracted to Sake’s dry food and Sake will likely want to eat Nori’s wet food and dry food. What feeder(s) would best solve our dilemma? Hello Jane, I think your dilemma will be solved with 2 feeders rather than one. If getting 2 Surefeed microchip feeder you can feed both cats their different diet without each one eating the other’s food. SureFeed does not restrict intake so it would work perfectly for you. I have a friend who has been feeding a feral cat on a mostly daily basis – the cat comes along once a day (but sometimes has a gap of a day or two) very early in the morning and is not seen for the rest of the day/night. My friend is going away at Christmas for a couple of weeks and does not have someone who can take over the feeding of the cat except perhaps once a week. 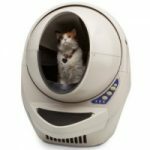 I am looking for an automatic food dispenser (or two) that she could start using now to get the cat familiar with the dispenser a few months in advance – the cat has wet and dry food so I was thinking of a wet dispenser and a dry dispenser that can be left outside and could run on batteries. It would need to dispense one meal a day for 5-7 days (at which point it would be replenished). I am not sure my friend would be able to ‘build’ something to protect or house the dispensers and I don’t believe there is any outside electricity. Hi Maria a very good option would be the Feed and Go but unfortunately this feeder does not run on batteries, only on AC plug. The good thing of this feeder is that you can control it throught your Smartphone, PC or Laptop. You can also see your pet when eating through a built-in webcam. This is an excellent feature if leaving the pet alone for 5 or more days. If you can find a way to plug the feeder and still leaving it outside it would be a good solution for you. Otherwise, the second best feeder that works on batteries and can be used with dry and wet food is the Petsafe 5-meal. Make sure to place frozen wet canned food in the trays before leaving it for some days. Make sure the first and second meal to be wet and then the rest dry food. Good luck. We live in Canada and have two Bengals that LOVE their food. The problem is they wake us up at 4am for food. They don’t share well, but we were hoping there was one dispenser that fed two cats at the same time, with the same portions. Please direct us in the right direction! Hi Angela, thanks! I am happy you like my website! Regarding a good cat food dispenser to feed two cats I have two in mind: The PetFeedster and the Super Feeder. The PetFeedster has a tray big enough to feed two cats without any problem, but you say they don’t like to eat together so there is a fancy solution from a customer to use the PetFeedster with a toy dispenser. See this solution here. On the other hand, the Super Feeder can be adapted to feed two cats if you are handy enough. You can see my review of this feeder here where you will see a video how the Super Feeder was adapted to feed two cats, separately. Portions will have to be splited by gravity because it can’t be divided in two parts in one dispensing when feeding the cats at the same time. Hope that helps! Loved the reviews but cannot find one that ships to Australia!!! Do you know of any that do or the best of the Australian ones? I know that Pet Feedster Company ships to Australia, just contact them! Does anyone know of an automatic feeder that has a digital timer and two dishes side by side? I need to be able to feed my two cats simultaneously but they need a dish each, and most of the two tray feeders use separate mechanical timers that cannot be synchronised. I emailed the Feed & Go people to suggest doing a two cat version. All they’d need to do is modify the lid so two compartments can be exposed at once, with a slight adjustment to the software to allow for this. Only trouble with that idea is that the first two meals are exposed immediately, and you only get two more mealtimes, but this would be better than nothing! Any two cat solutions please? Hello Stuart, do you want to feed your cats dry or wet food? Thanks for such an informative website! We originally purchased the Cat Mate C10 automatic feeder quite awhile ago, but our cat figured out how to get into it quite quickly. (despite our best efforts). We need to feed her wet food, as we administer her medication by crushing the pills up in her food. Which feeder (for wet food) would you recommend for a very smart, VERY food motivated cat? Thank you so much for any help- it’s greatly appreciated! Hello Lindsay! for wet food I recommend you the Feed and Go. It’s designed thinking of very smart and food motivated cats so they can’t break into the unit. The feeder doesn’t have ice packs but it has been tested with wet food during 3 days in 83 degrees heat and the food is OK after this period of time (the top seals almost airtight). For extra freshness you may want to place the wet food frozen and spread it on the slots. Check the full review of this feeder here. I adopted my cat who is over weight and likes to wake me in the wee hours of the morning like clockwork to get fed. So I’d also like to keep my sanity by not being woken so early before I have to get up for work. My husband and I do travel a lot. And always seem to find someone to care for my cat for long periods. For weekend get aways we can manage leaving him alone for one night. I’m wondering if any of the automatic pet feeders can dispense two different kinds of kibble. My vet recommended a Royal canin but I like something with less corn or wheat. So I also mix in another slightly smaller dry kibble to provide more protein. 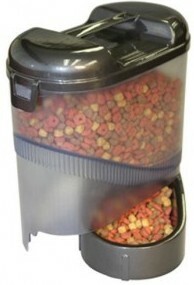 Can any of the automatic feeders dispense two sizes of kibble without getting stuck or jamming? Hello Lindsey! Fortunately there is a feeder that will dispense mix kibble without jamming! I actually feed my cat mix kibble and I use the PetFeedster to dispense a mix of Petcurean Go (small round kibble) and Fromm Game Bird (irregular shaped kibble). The PetFeedser dispenses this mix with no problem. One thing you need to consider is to adjust the Flex Feeder to the widest so it doesn’t jam. I travel a lot and this feeder hasn’t stopped dispensing because it has battery backup in case of a power outage. You can check a review with a video I made with the PetFeedster here. Hope that helps! We have 3 cats, all of whom need to go on a reduced food diet, 1 much more than the other 2. 1 Cat is a food bully. They are not microchipped, and have never worn collars, but I don’t think it would be too difficult to introduce them. What would you recommend to ensure that each cat only gets their specified daily amount? Hello Aerin, the SureFeed microchip cat feeder works good for cats. Hi Rob I am sorry to hear about that horrible experience you suffered. Regarding your question, gravity feeders are practical because you don’t need batteries or complicated systems for them to work, however most gravity feeders need a little shaking once in a while for the kibble to drop to the tray. This is due to the fact that the accumulated dry food inside the hopper needs a little help to keep dropping towards the tray unless you use very small round kibble. If a feeder has a large capacity the need of a “touch” to the hopper may be less often. The Bergan Elite feeder has a capacity of 13 lbs (not sure if enough food for 7 days with 5 cats though). Also, if the cats are smart enough they can help the feeder to release more food by sticking their paws inside the chute in which case it wouldn’t be necessary to shake the hopper. I wish I could help with more ideas, thanks for taking care of those cats, I really thank you for that!! Take care. Hi! I have two cats. We think one may be diabetic, and can only have wet food. He wakes me up in the middle of the night every night to be fed. I am looking for a selective feeder that can give him numerous small wet food meals timed throughout the day/night, but won’t allow the other cat to eat his special food. Is there anselective feeders that has the feature of being timed to feed multiple meals throughout the day? Thank you in advance! Hi Chari! The SureFeed Microchip Pet feeder works with collar tag or a microchipped cat so only the authorized cat can eat from it. 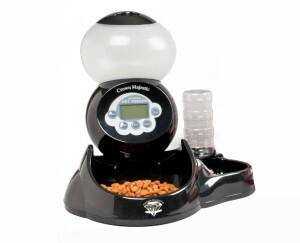 However, the feeder has a free feeding system without timer and you need timed meals. What I can suggest you is creating a feeding station using selective automatic cat door, you can check my article here. Hope that helps!